The Implied Duty of Good Faith and Fair Dealing - Martin|Hild, P.A. Parties to a contract may have implied duties that are not clearly expressed in the contract. One of these implied duties, the duty of good faith and fair dealing, was recently affirmed in Metcalf 1 by the United States Court of Appeals. In that case, the court reaffirmed that event the government is required to act in good faith when performing its part of a contract. Further, the court held that the implied duty requires parties to cooperate, and to refrain from committing acts that will hinder performance of the other’s duties. For construction contracts, this generally means that the parties must refrain from committing acts or omissions that are inconsistent with the contract’s purpose or which impact the other party's performance of their end of the contract. Notably, parties can provide some definition to this implied duty by contractually specifying the notice and timing requirements for documents necessitating cooperation between the parties, such as, change orders, requests for information, and submittals. 1. Metcalf Const. Co v. United States, 742 F.3d 984 (Fed. Cir. 2014). 2. 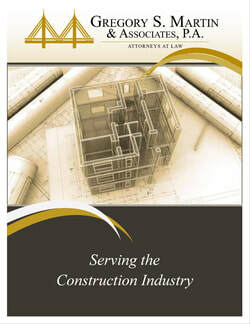 Triple R. Paving, Inc. v. Broward Cnty., 774 So.2d 50 (Fla. Dist. Ct. App. 2000). All contracts include implied terms and conditions such as the implied duty of good faith. A party who fails to act in good faith may be liable for damages arising out of that breach even though the term is implied.